Please note that the content of this book primarily consists of articles available from Wikipedia or other free sources online. The Deming, New Mexico is located at 400 East Railroad Avenue in Deming, New Mexico. It was built in 1881, and lies between a Union Pacific and BNSF Railway right-of-way. 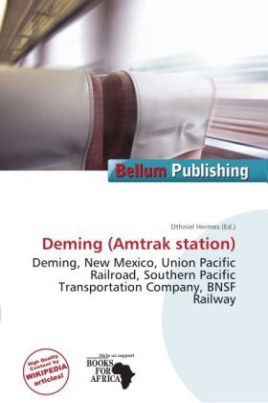 Of the seven New Mexico stations served by Amtrak, Deming was the sixth-busiest in FY2010, boarding or detraining an average of approximately 2 passengers daily. The BNSF Railway is a wholly owned subsidiary of Berkshire Hathaway Inc. and is headquartered in Fort Worth, Texas. It is one of seven North American Class I transcontinental railroads and the second largest freight railroad network in North America, second only to the Union Pacific Railroad, its primary competitor for Western U.S. freight.